We are starting the week on a rainy, dreary and windy Tuesday. I decided to brighten their day with colorful lunches and pack all their favorites. 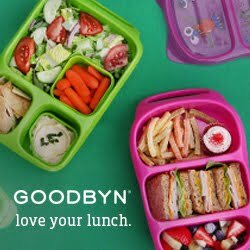 I packed our yumbox with a blueberry Chobani Champions tube yogurt, apple slices and kiwi, left over chicken, mini ice cream shaped peanut butter sandwiches and some baby carrots with dip. We packed milk today instead of water. For my second grader I added some sun with a funny Lunchbox Love Card, and packed his yubo with Pirate Booty and cinnamon almonds, puzzle shaped peanut butter and blueberry jelly sandwiches and vanilla yogurt with Naturebox Vanilla Macroon Granola and a few mini chocolate chips. He brought home made strawberry milk in our thermos Funtainer. Hope the sun peaks out for lunch! My 5th grader brought lunch in his Laptop Lunches bento box filled with Pirate Booty and Cinnamon Almonds, apples (and mini chocolate chips for his yogurt in the mini container), vanilla yogurt and a nitrate-free salami sandwich on whole wheat bread. He packed some lemonade to bring summer to school. Let's hope the rain goes away!! Great lunches! It's a rainy day here today too!